John Evans, a Geologist from Perth, Western Australia, was diagnosed with bone cancer in 1974 after suffering extraordinary pain in his lower left leg. Unfortunately for John, this meant having an above knee amputation. As a keen exploration geologist searching for minerals the whole of his career, John continued to explore harsh terrains throughout Australia with one leg, which was quite an adaption for him. Fortunately, John had a positive support base and stayed in this line of work until retirement at age 69. Now in 2017, John lives happily with his wife, Carolien, in Victoria. Being retired since the end of 2016, John recently decided to do something for himself and formed his own private company and is keeping busy working on a number of projects. For some time, John found he was unbalanced when he walked and wasn’t content with his prosthesis. After a lot of research on where he might find the most suitable prosthesis for his requirements, he identified Blatchford (the parent company of Endolite US) and was keen to find out more about Linx – the multi award winning integrated limb system. 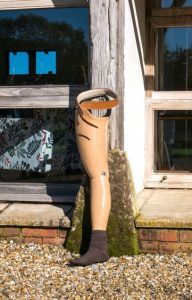 Being nearly 70, John was unsure whether Linx would be the right leg for him. However, after making contact with Blatchford in early 2017 and discussing his options, John decided to make the trip over to the UK to trial Linx. John is overjoyed with his new leg and told us “Having been at the clinic and now having Linx, I’m really happy we made that decision.” He can’t believe the impact Linx has made on his life already, in particular how easy it is for him to walk in a balanced straight line; something which was near impossible for John before trying Linx. For many years John had not joined his wife for walks but now they can walk hand in hand.